Last week Joanna Rowsell-Shand was one of the celebrity guests at the Cycle Show held in Birmingham NEC. 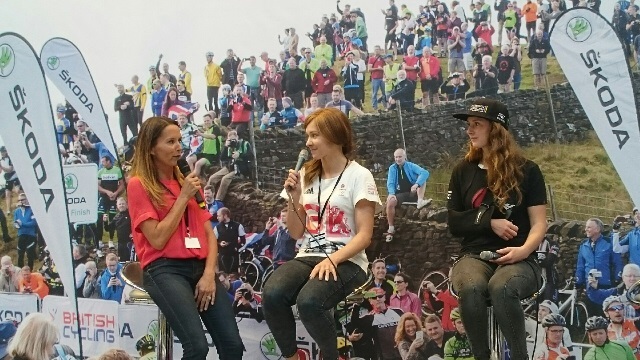 She appeared at the Total Women's Cycling Stage alongside Downhill mountain biker Manon Carpenter and was interviewed by Annie Emmerson. I also caught up with Joanna after the Total Women's Cycling Awards. Here are a few words from her. I don't go to London much now. My family have moved up to Shropshire and I am based in the North-West. My parents have just bought a house in South-West France and I am looking forward to going there. My favourite climb is up the Brickworks [near Macclesfield]. It's steep enough to test yourself but you can still power up it and get a good speed going. My brother [Erick] raced in the Tour of Britain. Ironically I didn't get to see him when they did the stage to Tatton Park as I was down in London! Rio was a great experience but the way Mark Cavendish described it on the Sunday Brunch show was true! The food was not great. Also we couldn't drink the water or eat any fresh fruit and veg. I ended up living practically on energy bars and protein bars over the 2 weeks! We also took out loads of wet wipes as we weren't allowed to get water on our faces when showering, in order to avoid the risk of contracting any waterborne diseases. It made showering quite an awkward process! It was a shock to the system to move from the comfortable surroundings of the Celtic Manor, Newport, to the accommodation in the Olympic village. The bikes we used for the team pursuit in Rio were only given to us for that race. We used them for the first time when we arrived in Rio. The other bikes we had been using, UKSI bikes with Mavic wheels, were already very light and fast, but the Cervelos with new Campag disc wheels we were given for the Olympics were even better. It was exciting to get new sets of equipment. We had to pull out all the stops to win as the Rio track had longer straights than other tracks and the air was cooler, which made it a slow track, and a harder task than London 2012. We ended up going faster than we had ever done, and it was great to break the world record. Some people did question our sudden improvement on our results at the World Championships, but the new equipment we had was a marginal gain. It was not a game changer though. Our achievement was more down to our hard work. Anna Meares [Australian track sprinter] made a few comments to the press about our sudden improvement but speaking to her I think that what she said was taken out of context by the media. I would really like to go to the Tokyo Olympics. I'll be 31 by the time Tokyo comes round, and there are lots of youngsters coming through who are very quick. But I will do my best to get a place. This is an exciting time for women's cycling with the Women's Tour, the Tour Series, and the Revolution Series. 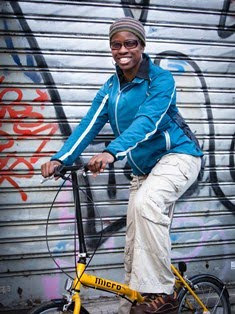 I would encourage women to get out and do track cycling. Find your local track. There are lots of outdoor tracks and they aren't steep so are great for beginners. You can do it over the winter. I am enjoying my break. It's great to not be feeling tired all the time, which happens on the days when I am in full-on training. I can eat what I want, ride at a leisurely pace and I don't have to be eating 30g of protein every three hours! Yes, I seem to have started a trend with weddings! Since my wedding [in Summer 2015] there's been Lizzie [Armitstead], Laura [Trott] and Jason [Kenny]. Then there's Dani's [King] and also Andy Tennant will be getting married soon. I love talking about "my husband" rather than just "my boyfriend". Finally, my husband and I can now have our honeymoon. We are doing a road-trip around the US and I am really looking forward to it. We'll be there during Thanksgiving so hopefully we can make the most of some Black Friday deals.